I'm here because a lot of the awesome people from GR came here. I won't pester people with follows/friend requsets. That's uncomfortable, imo. But please, feel free to friend request me so I know you're open to talk to an author! I love talking to people or just reading their reviews. Reading progress update: I've read 100%. I don't think I'm going to rate this book. I'm not sure I can. Parts were funny, really funny, but it got about midway through and I felt like this wasn't the book I expected. That's not the author's fault. it's mine. I was expecting more bite and more snark and something darker. The main character of the story is kind of a bland guy--which is done purposefully, but it makes some parts in the middle really drag. I was more interested in his 'nemesis' who seemed in the hypomanic stages of his bp cycle. (That's not snark, I really felt like that was a hypomanic stage: extremely energetic, big aggrandizing gestures, throwing money at things, hypersexual--I know these symptoms researching my own character). That character was very colorful and sucked the energy right out of the MC. When he left a scene, I was left with Doug--and frankly, he was boring the crap outta me. The images of hell and the landscapes are pretty incredible. I love the author's imagination and I think this would make a really cool looking graphic comic. Little things like skullflowers are very vivid. I don't think i'll ever forget them. And the author did an amazing job of making Hell unique. I'd give the five stars to the Hell bits of this book for sure. The story? Well, it's also unique, but just not what I was hoping for. Again, that's not the author's fault, so I choose not to rate it overall. Would you want to read it? 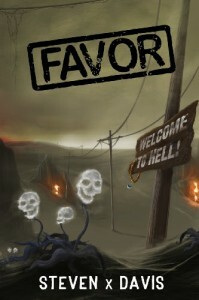 If you like morality stories and vivid scenery and want to read a unique take on hell with pretty funny bits between, this book is for you. If you want snark and and a really dark story, then probably not.